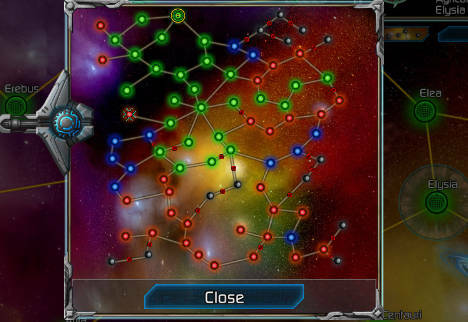 Puzzle Quest: Galactrix released about two weeks ago. I can't tell you how excited I was to be reviewing this game. The original title in the series is one that I have purchased on multiple platforms and poured innumerable hours into. And, after investing a considerable amount of time into this new game, you will never see a review for it written by me. I'm done. That isn't to say that I have finished the game; far from it. If I had to guess, I might be about halfway, perhaps even a third through the main storyline, if that. 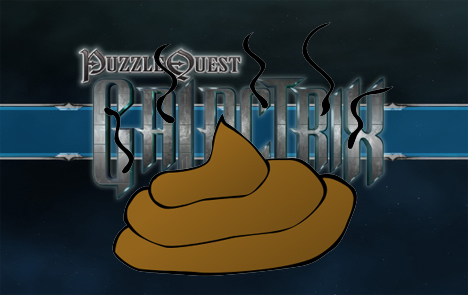 The truth is that Puzzle Quest: Galactrix is a terrible game, and I refuse to go any further with it. I do feel that I owe everyone an explanation, however, and that's what this post is. Not a review, but a look at the ways in which Infinite Interactive managed to take one of the most charming and addictive games in recent years and turn it into a steaming pile of crap. 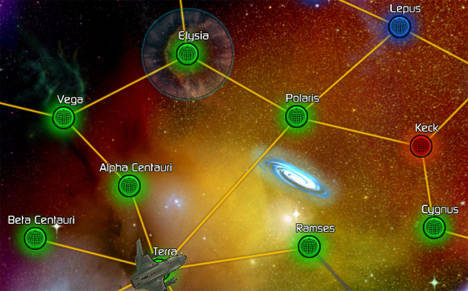 The first issue with Galactrix lies right at the core of its gameplay: the game board. 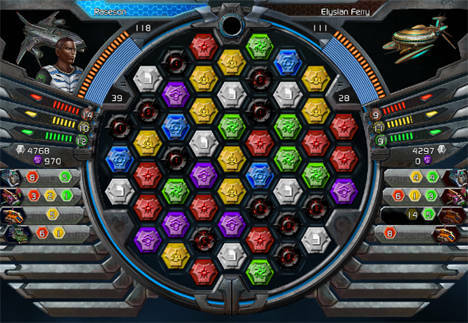 Puzzle Quest: Challenge of the Warlords utilized an eight-by-eight square of gems which, when matched, would disappear from the board and send new gems cascading in from the top of the screen. 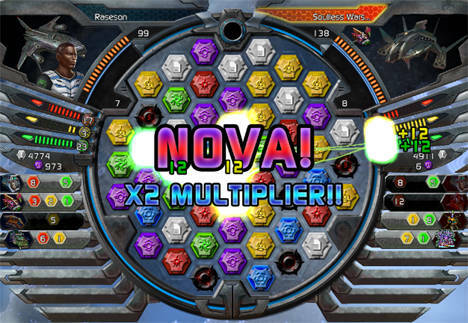 Taking things in a different direction, Galactrix has a hexagonal board that measures eight gems across at its widest points. Gems can now be moved in six directions and how a gem is moved to create a match determines how gems fill in the space created by their absence. When I first learned of this design, my initial thoughts were that this would revolutionize the way the game was played, changing it into a far more strategy-based experience. The former method lent itself to a lot of randomness that I expected to be reduced. In practice, it has the exact opposite effect. Due to the size and shape of the board, making chains of cascading gems is an almost entirely random affair. It's rarely possible to see and execute a chain of even three sets of gems even if you are working from one of the far ends of the board. And, due to the number of ways gems can be moved (and all of the increased possibilities that brings), scheming to force an opponent into making a misstep is nearly impossible. The result is that success or failure relies more on luck than ever before. Acquired abilities mitigate this, but not any more so than in the original game. An added shield mechanic where blue gems can be matched to recharge defenses helps to prevent sudden loss due to random enemy cascades, but very little. 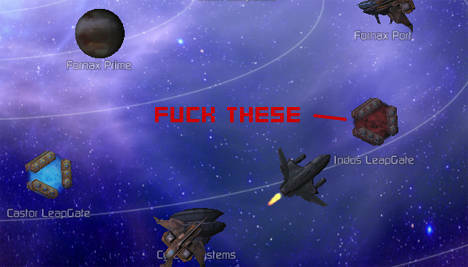 Another major problem is in regards to how you travel throughout the galaxy in the campaign. Warlord's map system was not great, but it was at least functional and easy to access. The over eighty locations would appear as they became relevant to your quest and travel between them was merely a matter of selecting where you wanted to go, and off you went. 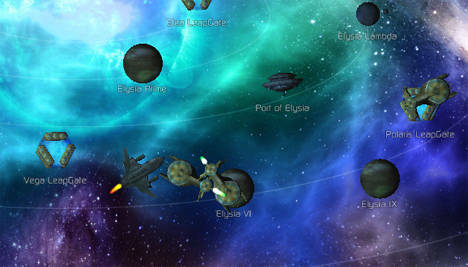 Galactrix also has a rather large galactic map and it's all available to you from the very early in the game. But the way you move between them has added another step to the process. Star systems are connected by "Leap Gates," a network of linked passages where ships can travel at faster-than-light speeds. The problem is that they're all closed at the start and must be hacked open by way of a puzzle game where you must match colored gems in a sequence within a time limit. There are about eighty different solar systems in the game (possibly more if some remain to be discovered), and going to each of them requires hacking a gate. Many of them have multiple points of access as well, adding to the number of times you may have to deal with them. And, on top of all of this, gates will occasionally close and force you to hack them again. It's highly annoying to have to open up every path directly and makes the entire process tedious. In addition to the interruptions in your travel caused by the Leap Gates, encounters with hostile forces occur as you pass through systems. This isn't new to the series, as practically every path in Challenge of the Warlords would have a monster blocking your path which you would fight or capture. The difference here is that they would appear on the map previously and you could, in some cases, circumvent them by taking a different route. Encounters in Galactrix are out of the blue. When an encounter happens, you are taken into the system you were traveling through and must either outrun enemies onscreen (highly unlikely) or duke it out. They usually only occur when passing through hostile systems, but not being able to see them can turn an otherwise speedy trip across the galaxy into a painfully slow exercise you might have been able to avoid as you slog through one enemy after another. The map is also utterly useless in regards to the information on the solar systems you will enter. Each system contains planets, spaceports, asteroids and so on, effectively increasing the number of places that you can engage in puzzle questing by a magnitude of five (roughly calculated). The map, however, gives no information about a system except for the organization or race which controls it, what kind of government they have and the type of system (industrial, mining, etc.) it is. Is there a port there? How about a shop for new equipment? Will there be asteroids that the player can mine for resources? Sorry, you're going to have to potentially waste your time checking it out yourself, even if you've already visited it before. It is pointless and frustrating and a problem that could have been solved so easily with just a brief text display. This is 2009 and, while I love my gaming roots, I should not have to keep records for this crap on-hand like I would on a game made ten or fifteen years ago. Last in our triple threat of major shortcomings is the game's setting. It seems as though the designers intended to create a universe of interesting species with a deep history (such as can be found in Mass Effect, for example) but there's nothing of the sort here. 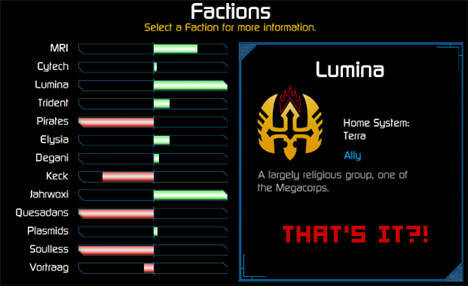 Despite the character you play being a member of a powerful organization within the galaxy, you are given very little information about who resides within it. If you want to expand your knowledge of the world, visiting planets and moons will give you an opportunity to gain rumors. But the rumors aren't seedy little secrets or anything, serving to establish the setting as a whole. So, unless you're willing to really work at it, every group in the game is utterly interchangeable with the next. The story mode is bland as a result and does not inspire the sort of intrigue and adventure which could make such a setting compelling. I really hate to say it, but Puzzle Quest: Galactrix is several steps in the wrong direction for the series. Nearly every aspect of the game feels like a mistake, taking the flaws that existed in its predecessor and amplifying them. I can only hope that, in future titles, these sorts of issues will not make a new appearance because there's absolutely no way I could recommend this game to anyone. The reasons above have literally stopped me in my tracks. If there is some sort of hidden depth, epic story or other gold at the end of the rainbow, it is impossible for me to care about it any longer. There is absolutely no reason why anybody should have to deal with these issues in what is supposed to be a form of entertainment. I am not an impatient man but this is unacceptable. All I can say is that I hope my experience has spared you a similar fate.